Canon-P-150C-Scanner Portability like noother, Ultra compact & Convienent Document Scanner. Portable, Sleek and Stylish Design (Measuring a mere 2 x 2.75 inches (50.8 x 70 mm) in size when closed) - Software installation is not required. The Capture On Touch Lite instruction will automatically appear upon connection to quickly convert hardcopy documents into electronic files. 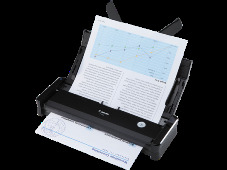 Portability like no other, Ultra compact & Convenient Document Scanner. Software installation is not required. The Capture On Touch Lite instruction will automatically appear upon connection to quickly convert hardcopy documents into electronic files. Ideal for users who have highly mobile job environment or temporary set up with office function such as : Event Organizer, Surveyor, Leasing or Financial Company.